“I want nuclear weapons to be history before my son grows up” – Anna Göransson. Image by the Author. 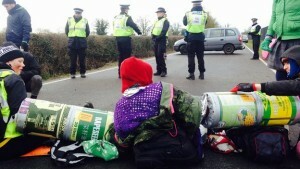 High hopes for nuclear disarmament as protesters close down military base and demand making nuclear weapons a thing of the past in favour of increased spending on the welfare state. 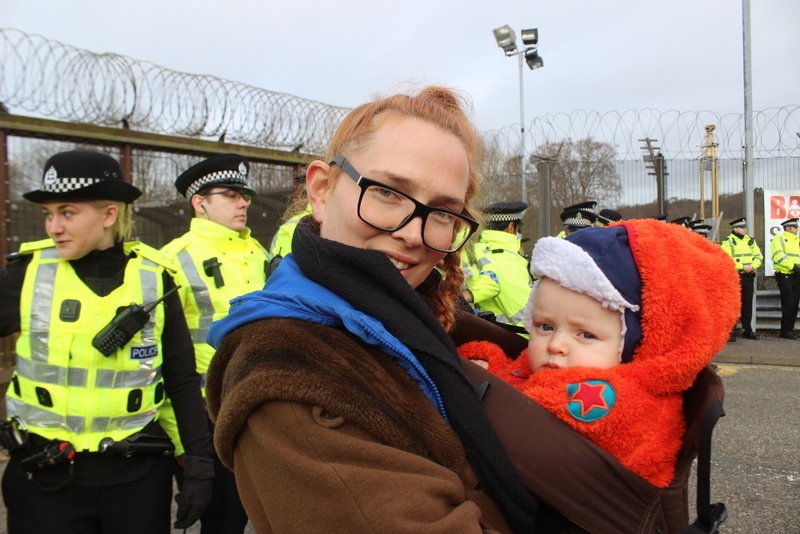 On Monday 13 April, over 200 protesters shut down the Faslane military base by the river Clyde near Glasgow, where the Trident nuclear submarines are kept. Groups of protesters were chained together in the chilly spring weather, forming human blockades outside key entrances to the Faslane site. The “Bairns, not bombs” blockade, which brought together trade unionists, party activists, religious groups, environmental campaigners and community members, was part of the Global Day of Action on Military Spending. WATCH: Independence Live broadcast from the blockade. click here to watch. 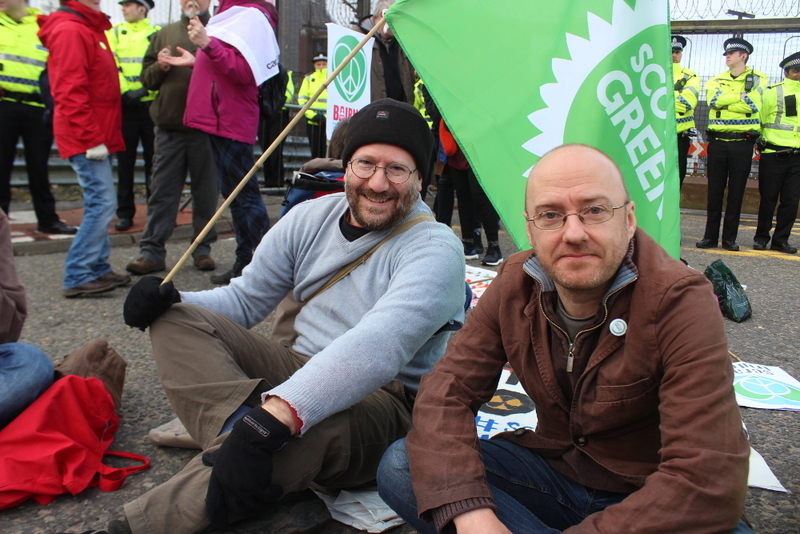 “It’s important that we don’t just march against, speak against and vote against Trident, but that demonstrate our opposition to this nuclear weapon through direct action”, said Patrick Harvie, MSP and Co-convenor of the Scottish Green Party who sat with protesters from the early morning hours. The blockade kept the Faslane base closed from 7am until the end of the day. Military base workers arrived near the base early in the morning, but were kept waiting on buses parked outside the protest area. Workers were offered an option to be transported to the base by ferry to go ahead with their workday, but they collectively refused to take up the offer. Throughout the day 34 arrests were made as police cut off protesters chained protesters outside the south gate, one of the main entrances to the site. Despite the arrests, the protest continued until 1.30pm, when workers were sent home and the blockade begun to dismantle. Cllr. Chas Booth and Patrick Harvie MSP of the Scottish Greens. Image by the author. The UK Government are currently planning on renewing the Trident system, and replacement is estimated to take over £100 billion out of the public purse. Protesters demanded that instead of funding a deadly weapons system, spending should be directed to improve public services and to stop the emerging climate disaster by funding renewable energy solutions. “Trident is a sign of a political system that has got its’ priorities wrong. We should be putting money into socially useful projects, not into a weapons system which, if it was ever used, would create the most catastrophic environmental disaster in history,” Patrick Harvie argued. Anna Göransson, a youth group leader from Sweden, brought her baby son along to the protest. “So many people are getting poorer and poorer and don’t have access to decent housing or healthcare services. In this situation, spending money on nuclear weapons is pure madness,” she said. For Göransson, the aim of the protest was to remind people of the military activities that are taking place around them. 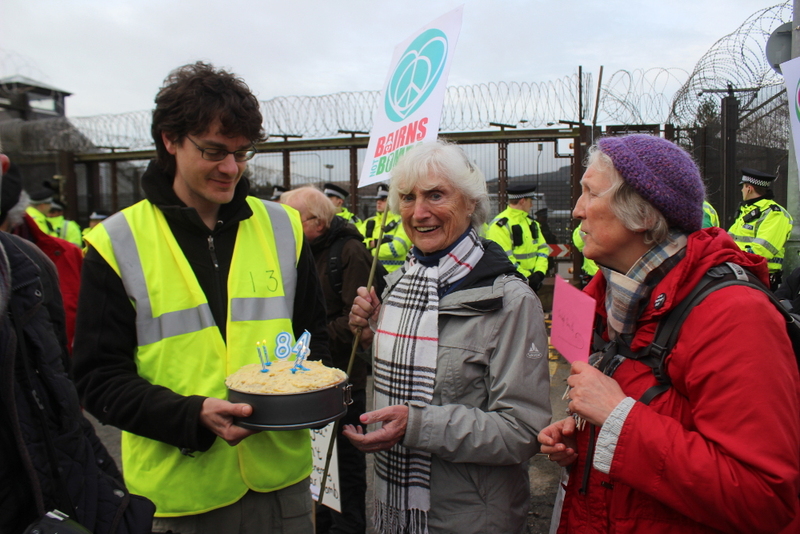 Blockader Isabelle celebrated her 84th birthday at the blockade. Image by the author. The atmosphere at the blockade was optimistic. Peace activists who’ve been protesting since the Cold War were joined by student groups and young families with toddlers. 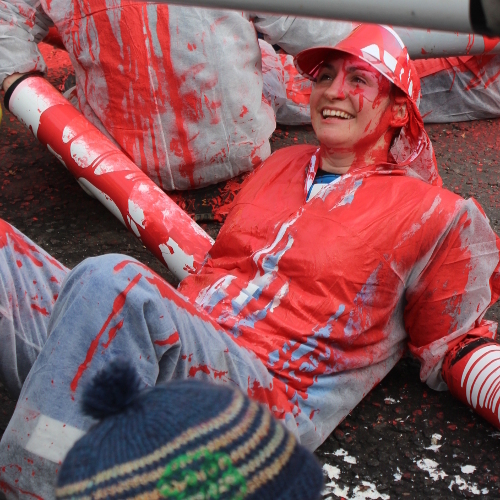 There was singing, drumming, painting and even a birthday celebration for an 84 year-old protester. 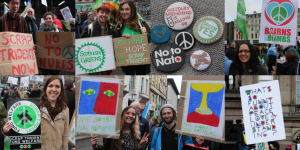 Many felt that the campaign for nuclear disarmament has been reinvigorated during and after the Scottish referendum campaign. Recent polls have suggested that the general public across the UK is against the renewal of Trident, and that support for the removal of the system is particularly high among the Scottish population. According to a Survation poll conducted in January 2015, 47.2% of Scottish people opposed a new generation of nuclear weapons on the river Clyde, while 31.6% were in favour. The social movement that was built on the Scottish Independence referendum and the SNP’s hard line on Trident have helped to put the issue in the centre of political debate in Scotland, with thousands marching in opposition to nuclear weapons in Glasgow in the first weekend of April this year. 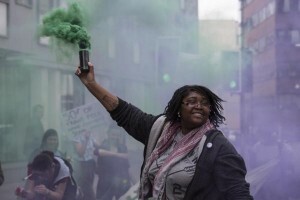 Monday’s protest was timed to ensure that Trident is firmly on this Spring’s general election agenda, and that the opposition to the renewal of the system escalates across the United Kingdom. According to Patrick Harvie, support for the renewal of Trident is starting to deteriorate among politicians and military officials. Even among the Labour Party, which is formally in favour of the system, individual politicians are beginning to go against the agreed line. “People at the top are starting to recognise that nuclear arms are the wrong strategic priority for the United Kingdom’s defence, as we face new challenges linked with cyber-terrorism and so on,” Harvie claimed. 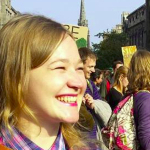 Cat Boyd, an activist from the Radical Independence Campaign, highlighted the need for sustained protest and public pressure to ensure that the right decisions are taken at the top. Nonetheless, Boyd was optimistic about a Trident-free Scotland. “We’re closer than we’ve ever been to getting rid of nuclear weapons. Public opinion is clearly on our side,” she said. Anna Göransson too had high hopes for the future.